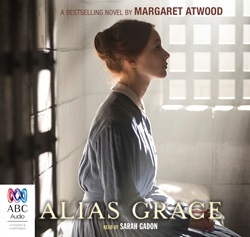 Alias Grace: Margaret Atwood ; read by Sarah Gadon. Item Information Catalogue Record 718527 . Catalogue Information Catalogue Record 718527 . Reviews Catalogue Record 718527 . TALKING BOOK Coburg Library . . Available .
. Catalogue Record 718527 ItemInfo . Catalogue Record 718527 ItemInfo Top of page . Alias Grace [talking book] Margaret Atwood ; read by Sarah Gadon. 13 audio discs (CD) (15 hr., 58 min.) : digital, stereo ; 12 cm ; in container. 'Sometimes I whisper it over to myself: Murderess. Murderess. It rustles, like a taffeta skirt along the floor.' Grace Marks. Female fiend? Femme fatale? Or weak and unwilling victim? Around the true story of one of the most enigmatic and notorious women of the 1840s, Margaret Atwood has created an extraordinarily potent tale of sexuality, cruelty and mystery. Sixteen years have passed since teenaged Grace was locked up for the cold-blooded murder of her employer Thomas Kinnear and his lover, Nancy Montgomery. Saved from the gallows where her alleged accomplice was hanged, Grace claims to have no memory of the events which changed her life for ever. Dr Simon Jordan is an expert in the field of amnesia. His objective is to unlock the dormant part of Grace's mind and discover the truth behind one of the most enigmatic and notorious women of all time. Was Grace an unwitting accessory, or a cold-blooded killer? Marks, Grace, -- 1827- . Murder -- Canada -- History -- 19th century -- Fiction . Trials (Murder) -- Canada -- Fiction . Women murderers -- Canada -- Fiction . Catalogue Information 718527 . Catalogue Information 718527 Top of page .